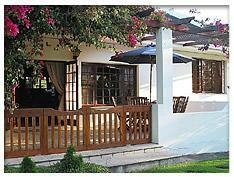 Far Hills Country Hotel is an inexpensive Garden Route accommodation that exudes style. Walk through the baronial-style entrance and you will find a comfortable, welcoming lounge complete with stunning antiques and large windows with scenic views of the spectacular Outeniqua Mountains. 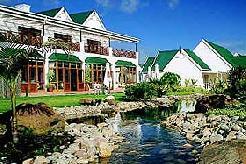 The Far Hills Country Hotel is an affordable destination allowing one to explore the magnificent Garden Route in its entire splendor and to play some of South Africa�s favourite golf courses - like George Golf Club, Bramble Hill, The Links, Pinacle Point and Ou Baai courses. 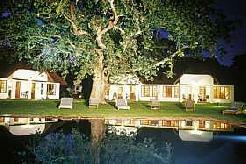 The 4 star Far Hills Country Hotel is true to its name as Purveyors of Fine Hospitality. It offers delightfully appointed, exquisitely furnished rooms with private balconies surrounded by lush gardens and the breathtaking Outeniqua Mountains. Meander through the gardens; enjoy the wide selection of bird life and carefully selected indigenous plants until you come to rest on the wooden deck shaded by a 100year old Oak Tree. 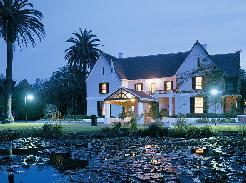 Far Hills Country Hotel is situated on the N2 National Road between George and Wilderness. It is conveniently placed for easy access to George Town, George Airport, Wilderness, Knysna, Plettenberg Bay, Mossel Bay and Oudtshoorn. 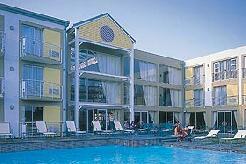 Approximately mid way between Cape Town and Port Elizabeth, it is a popular venue for golfers travelling the Garden Route. 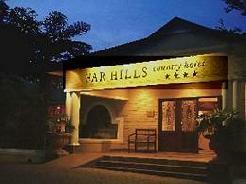 Far Hills accommodation has 52 rooms, that are divided into 24 Deluxe Rooms, 20 Standard Rooms and 8 Traveller Rooms. All the rooms at Far Hills have en-suite bathrooms with separate bath and shower, plus Safes, Hairdryer, Telephone, Private balconies, Satellite television, Tea / Coffee making facilities. 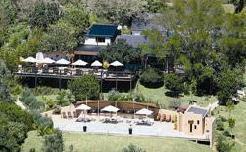 The Deluxe Rooms at this Garden Route accommodation are situated in the beautiful gardens with either garden or mountain views. These large luxurious rooms are exquisitely furnished and have a modem connection, plus a private mini bar and warm cosy fireplace for those chilly winter nights. Guests who stay in the Deluxe Rooms have the option of either twin or king size beds on request. We recommend the Deluxe Rooms. The Standard Rooms are situated close to the main building and have fantastic mountain views. 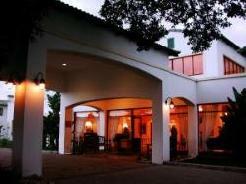 The spacious rooms are decorously furnished and there are 8 with inter-leading rooms. Guests have the option of either twin or king size beds on request. The Traveller Rooms are also situated close to the main building. These are smaller budget type rooms which have overhead fans, heaters, plus bath and shower combined. Guests have the option of either twin or double beds on request. Let the Executive Chef take you on a palette popping journey of fine food and wines. Browse the wine cellar at Far Hills Country Hotel, which has been completely refurbished, sporting a unique look. Guests can enjoy any of the delicious new dishes at this Garden Route accommodation or stay with old favourites. Dine on fresh sushi at Teppanyaki and Sushi Bar opposite reception. This is a small, intimate restaurant and guests are advised to book early with reception to avoid disappointment.